For the past three years, Models Own Polish for Tans range has become as synonymous with summer time in the British Isles as rain and disappointment. This year's additions to the range provides us with a much-needed injection of bright neon colour that will make your tan pop. Now, as you can see, I am not a tan person and never will be. I'm probably not the best person to attest to the polish's power to make your summer tan pop BUT I am here to show you that the polishes aren't just for the sunkissed amongst us but they also suit us ghostly kids who hide in the shade for fear of becoming the most delicious shade of raspberry pink. Models Own were kind enough to send these over so continue on to see some swatches and read about how I got on with the shades. Everyone and their Aunt by now must be aware of the newest phenomenon to sweep the entire planet, Pokémon! No you haven't entered a time warp and emerged in 1998. There is a new app being rolled out in different territories across the world that allows you to capture Pokémon and battle (like the games) in real like using augmented reality. DO YOU REALISE HOW BIG OF A DEAL THIS IS?!? For someone who was OBSESSED with Pokémon back in the day (Pokémon Blue 'til I die! ), this app is a dream come true. Unfortunately, the UK and Ireland have not been included in any of the territorial releases yet (although there are workarounds) so I haven't gotten to sample to app yet. I'm incredibly jealous of all the Facebook updates and Buzzfeed articles that keep rubbing in the fact that I'm not encountering any Zubats on my way to university. 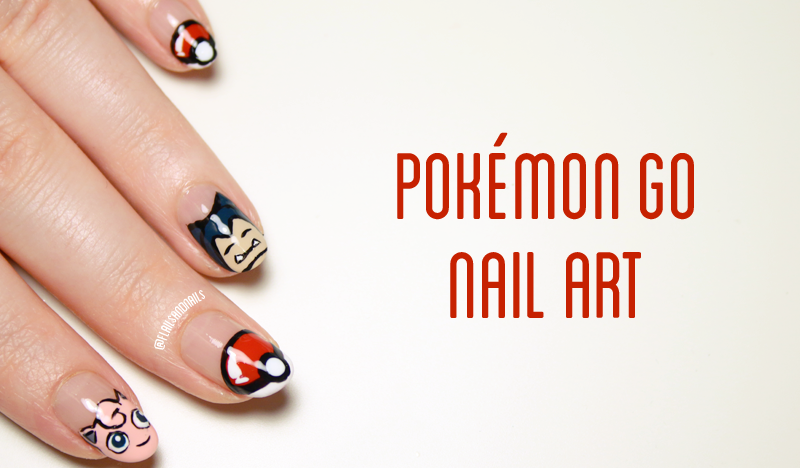 What I can do is do some Pokémon nail art featuring two of my favourite characters while I anxiously await the official release of the app here. 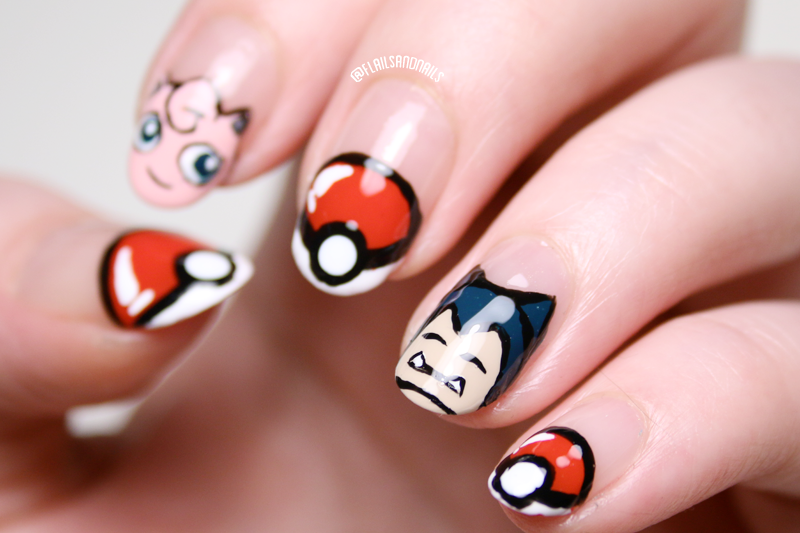 I do love creating nail art based on animated characters because they're so much more straightforward to recreate. What I did find difficult was my handling of my brushes when I began to outline. I really need to invest in some better quality brushes or maybe just take better care of mine because they tend to curl at the ends. In some looks, the haphazard style lends them a kind of charm but for something like this, I wish the outlines and small details were a touch cleaner. I chose to recreate Jigglypuff and Snorlax in my manicure because they are genuinely two of my favourite Pokémon of all time. Jigglypuff was hilarious throughout the series' and Snorlax is the Pokémon embodiment of myself. I remember playing the game and secretly revelling in the fact a Snorlax blocked my way because I loved going on the little missions like finding the magic flute (no that is NOT a euphamism). Also, I'm a strong proponent of the original 151 Pokémon (Johto is exceptable I guess) and these two just epitomise this era of Pokémon for me (apart from the obvious, Pikachu and Mew Two). I hope you've enjoyed this little trip down memory lane. For my younger readers this might not seem like such a big deal but for anyone in their 20s and 30s who got windswept into this craze, let's all rejoice together in the awesomeness of this app.